Ken and Gloria Temple are now on their way home after their 17-day trip in Germany. The trip was a dream come true for Ken, a lifelong family historian who wanted to combine a sightseeing trip with visits to four key ancestral areas, including meeting some cousins. When he went to his local AAA office they showed him brochures for tour bus trips which didn’t come close to what he wanted. Luckily, a friend who subscribes to a magazine where we advertise told him about European Focus. Ken and Gloria not only saw all that they wanted to see, but they did it in comfort and style and without being pushed to exceed their desired pace. 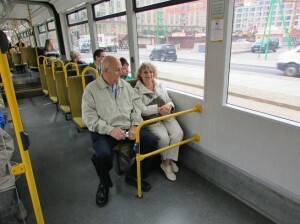 And for tram enthusiast Ken, their tour even included an ride with their guide around Dresden via streetcar. That would have been impossible on a Globus or Trafalgar tour. Posted in Europe Tours, Germany Tours and tagged custom, designed, dresden, europe, european, focus, germany, private, streetcar, tours, tram.